Until now this was one of the few stations that I had not photographed. 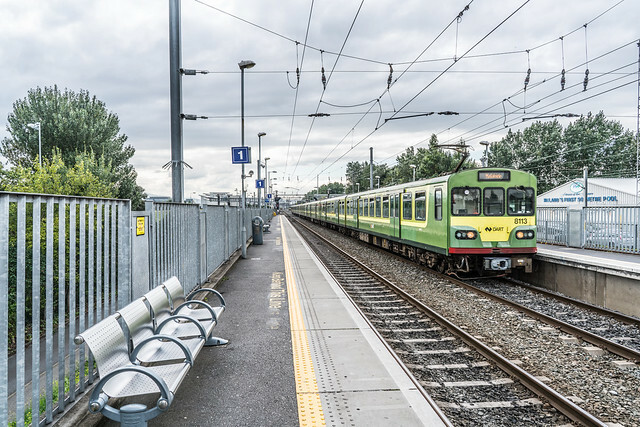 Clontarf Road railway station is located at the south-western end of Clontarf Road on Dublin's Northside, on the border between Clontarf and Fairview, and serves people living and working in those areas, as well as Marino and East Wall. The station is situated just north of Fairview DART depot. It was built in the late 1990s to serve the densely populated areas about, and also East Point Business Park and was opened on 1 September 1997. The ticket office is open between 05:45 AM to 19:45 PM, Monday to Sunday. The area was last served by the old Clontarf Station, almost a half a mile (a kilometre) north on the line. The remnants of that station can still be seen at the rail bridge over Howth Road, halfway between the start of that road and Killester village centre. This original Clontarf station was opened on 25 May 1844 and finally closed on 3 September 1956.